T. Boone Pickens knows better than almost anyone just how much the oil industry means to Texas. The billionaire oil tycoon has seen thousands of jobs disappear from his home state recently due to the crash in crude prices. Some smart people have even warned Texas could tumble into a recession like it did in 1986 when oil prices plummeted. Just don't tell that to 86-year-old Pickens, a veteran of countless boom-and-bust cycles in Texas. 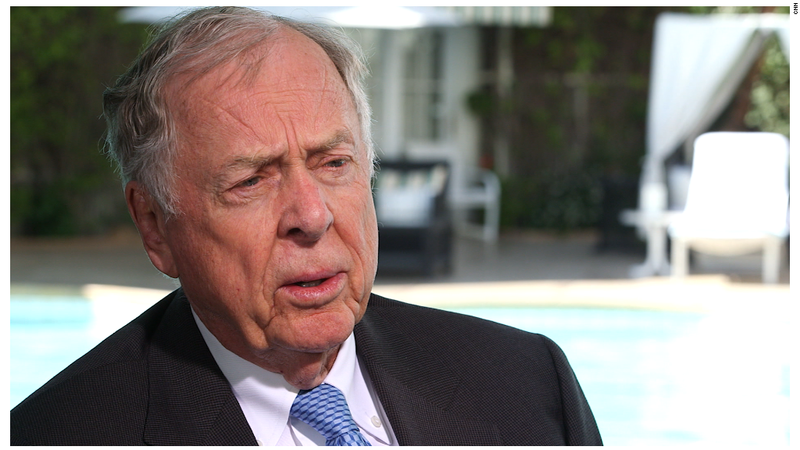 "Don't panic," Pickens told CNNMoney on the sidelines of the Milken Global Conference in Los Angeles. "I don't think Texas will fall into a recession. Oil will recover in price." Even though inventories are sitting at record highs, Pickens is standing by his call for oil to rise to $70 a barrel by the end of the year before rising to $90 to $100 in the next 12 to 18 months. Oil prices are currently at $57, up substantially from $45 earlier in the year. What makes him so confident? "I know more about it than they do. It's that simple," he said. He's not just talking about his gut and instincts. Pickens pointed to the dramatic decline in rig counts as oil companies pull back in the new environment. What that means is that the record high inventory will not last forever. Pickens also said the Texan economy is strong and resilient enough that it can withstand an oil-fueled slowdown. "We haven't flopped yet. We lost some jobs in the oil field, but we're fine," he said. Slammed by cheap oil, services companies like Schlumberger (SLB), Halliburton (HAL) and Baker Hughes (BHI) have all laid off thousands of workers in recent months, many of them in their home state of Texas. It's been a reminder that while inexpensive oil is great for American drivers, it's painful for people who rely on oil production for jobs in Texas, or in North Dakota. Nonfarm payrolls in Texas tumbled by 25,400 in March, the worst level since mid-2009 during the Great Recession. "Job losses of the size Texas experienced last month are rarely seen outside of recession," Michael Feroli, chief U.S. economist at JPMorgan Chase (JPM), wrote in a recent report. Feroli previously warned Texas could sink into a recession, a call that drew the ire of Richard Fisher, former president of the Dallas Federal Reserve. "Unfortunately, the only thing dropping in the Texas economy lately is the number of jobs," Feroli wrote in a report titled "No bull: Texas economy on the skids." Of course, the Lone Star state's economy has diversified significantly in recent decades into health care, finance and other industries. That means the impact of the oil crash is somewhat lighter and there's opportunities for laid off workers to find other places to work. Pickens said there are other jobs in Texas for laid-off oil workers. For example, there's great demand for truck drivers -- something the billionaire insists he has the skills for as well. "If I had to have a job and didn't have anything else I could drive a truck," Pickens said. "And they are looking for truck drivers continually in Texas."